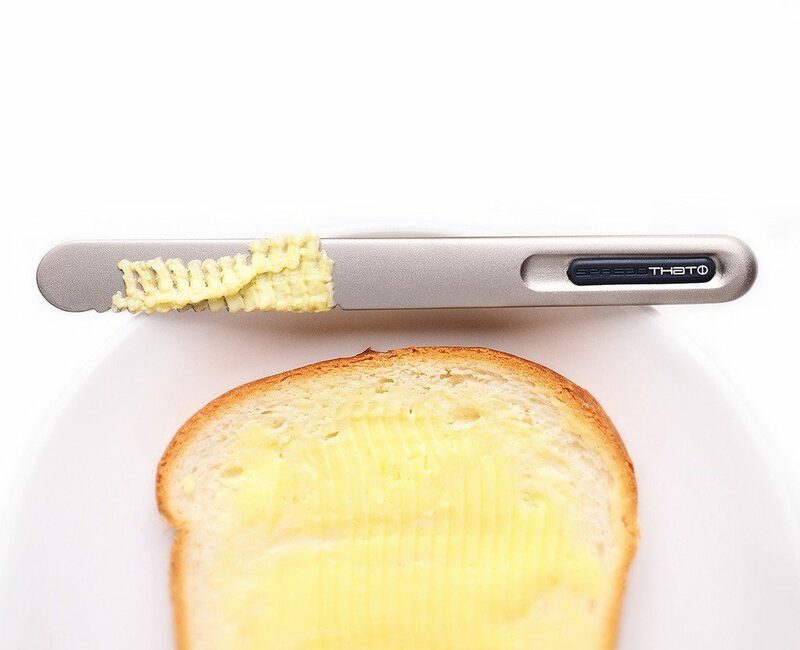 We have all been there, about to butter our toast when we put our knife into the tub of butter for it to be quite solid, and very difficult to spread. Trying to spread butter that is still quite hard and cold is near impossible, it just doesn’t work, you end up rolling a large chunk of butter over your toast or just leaving a large wedge there. What you need it someway to melt the butter making it easy to spread, and this is possible with heated butter knifes that use a battery to warm it up and melt the butter enough to make it perfect for spreading, however the SpreadTHAT knife goes an entirely different route, transferring your body heat to the knife edge to give it that butter-melting temperature making it perfect to spread. Designed and made by THAT! 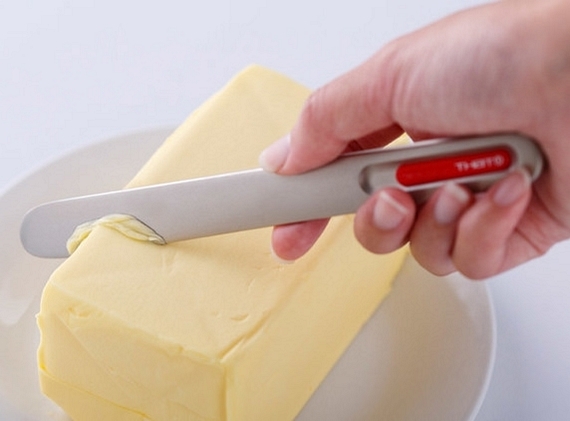 Inventions, it looks just like a typical butter knife with a slider-like switch on the handle. Although looking like an on off switch it’s actually just part of the heat-conducting tech that draws warmth from your palm and passes it off to the knife to soften even the coldest butter and spreads. The knife that is named SpreadTHAT uses an open-ended copper alloy tube inside the knife that runs from the handle to the end of the blade, because of this clever way of transferring the heat there is no need for batteries or power, just the heat from your body through your hand and onto the knife. With this method however the knife does take at least 20 seconds to get up to temperature as your body heat passes through your hand and onto the knife which is then transferred down to heat it up allowing it to spread the butter. There is a serrated edge designed to curl up and soften cold butter as you go to slice ready to spread. Design for both left and right handed users it has a stylish sleek Titanium shell with a micro-textured surface providing improved grip and spreading action when in use. This started out as a Kickstarter project which has turned into a consumer product which you can pick up now. SpreadTHAT is priced at $19.99 online at Amazon and can be bought in red or black.